المجلس الإسلامي العربي / Sayed Mohamad Ali El Husseini participated, concluded with a common prayer by the believers of divine religions. • الموضوع : Sayed Mohamad Ali El Husseini participated, concluded with a common prayer by the believers of divine religions. .
Sayed Mohamad Ali El Husseini participated, concluded with a common prayer by the believers of divine religions. 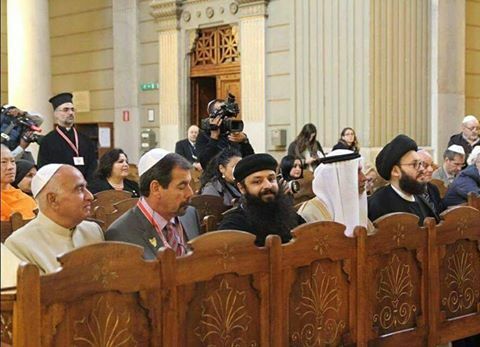 The conference of tolerance, peaceful co-existence, and religious pluralism in "Rome" 2016 in which Sayed Mohamad Ali El Husseini participated, concluded with a common prayer by the believers of divine religions. This emphasize the saying of Almighty:"
Those who believe in the Qur´an), those who follow the Jewish (scriptures), and the Sabians, Christians, Magians, and Polytheists,- Allah will judge between them on the Day of Judgment: for Allah is witness of all things"..